“One of the most outstanding finals in recent years. 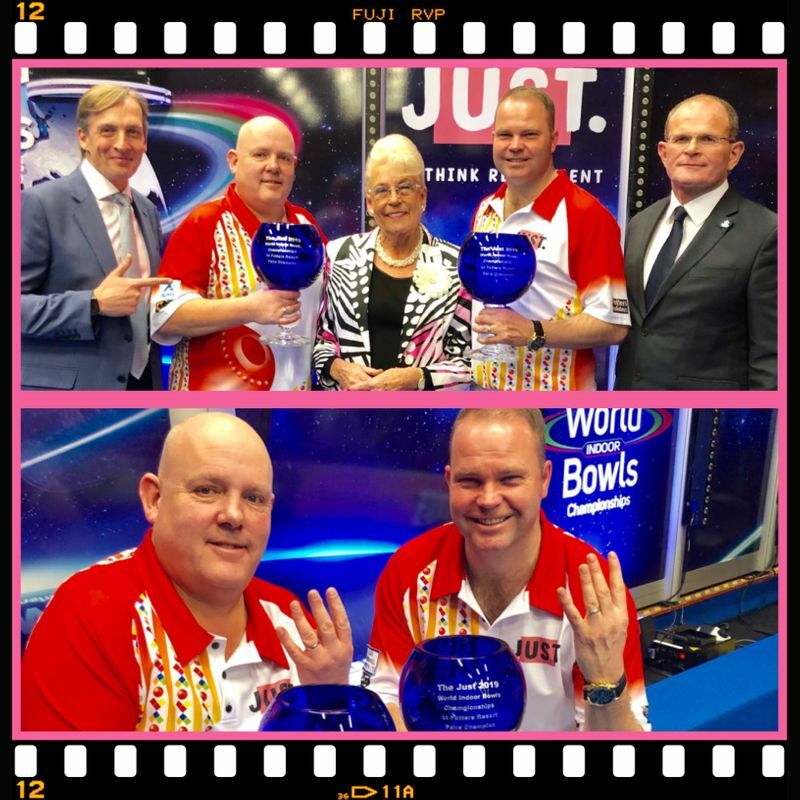 “It was quality, pure quality and didn’t disappoint” said Alex Marshall MBE minutes after taking out the Just World Indoor Pairs title for a fourth time with best friend and bowling partner Paul Foster MBE against the all English pairing of Greg Harlow and Nicky Brett. In a repeat of the 2010 final which the English duo won 13-4, 7-7, the capacity audience were left in awe as leads Harlow and Foster continually peppered the jack from start to finish in the best of two sets of nine ends title decider with the winners presented with stunning royal blue Langham Glass goblets. As the game got Underway the packed arena was left in no doubt that this final was going to be a classic with both pairs playing a procession of inch perfect deliveries and sometimes only the proverbial ‘fag paper’ deciding which bowl would win the end. In a thoroughly engrossing 2hour 13 minute match the Scots took the first set with a single on the last to win 8-6. Then in an exceptionally dramatic and high scoring second set twenty six shots were scored in total over the nine end set. The scoreline swayed one way then the other with the Scots looking favourites to take the title when they went 8-3 up after just three end. However Harlow and Brett turned the tables, reeling off a sensational 10 shots over the next four ends to march into a commanding 13-8 lead with just two ends remaining and looking like taking the match to a tie break. The Scots though regrouped and a treble on the penultimate end left then requiring a minimum of just two shots for a drawn set which was good enough to take the title. That scenario looked remote with skip Marshall facing a set lie against him when he went to play his last bowl… and what a stunner he played to hold a title winning double. Delivered with immaculate weight and line on a difficult hand, he gently turned the holding shot over twice which was just enough to hold the match winning double and they celebrated their fourth title as Brett’s last delivery – a forehand runner – fell agonisingly just a fraction on the narrow side of the target. Marshall said later “that was an awesome game. I think that was one of the most amazing displays of leading I have ever seen. Paul and Greg were simply out of this world. The title could have gone either way. Credit to everyone for delivering a great final”.